Justin Gulley of Team Wellington, right, marks up against Auckland City's Darren White during an encounter last year. 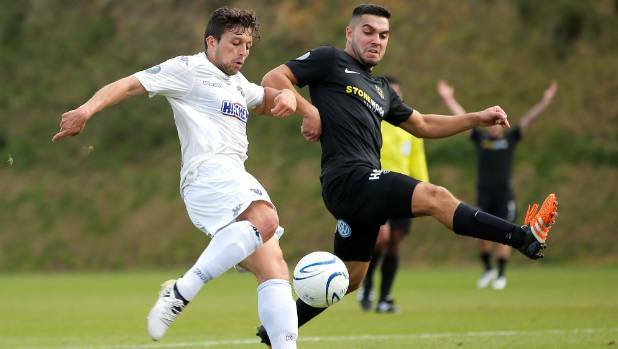 Justin Gulley was unable to watch the game, as he was on tour with the All Whites. But there was never any doubt as far as he was concerned. He knew Team Wellington would beat Canterbury United and reach the final of the ISPS Handa Premiership for a third straight year, even without their captain. "I ended up looking it up the next morning and saw the result, and I was pretty happy," Gulley said. The 25-year-old defender arrived back in Wellington on Tuesday, after a whirlwind week where he was called into the All Whites squad as a replacement for Storm Roux, who withdrew due to personal reasons. Gulley said he received a phone call from coach Fritz Schmid last Friday. He played in Team Wellington's match against Hamilton Wanderers on Sunday before jumping on a plane destined for Europe later than night. "Fritz himself ended up calling me and basically said someone's had to pull out and pack your bags, you're flying out on Sunday," Gulley said. As stoked as he was about the prospect of joining the national team, the call-up was tempered by the fact he would miss Team Wellington's semifinal against Canterbury United, which was scheduled on the same day as the All Whites versus Canada friendly. "I was absolutely stoked and buzzing but at the same time missing the semifinals was hard. But I knew the boys would pull through and do it without me." Although he is still waiting to make his All Whites debut - not one of the 17 players who took the field during the 1-0 defeat - Gulley said it was a great experience nonetheless. "It was my first time and it was a really good experience, just to be involved and be amongst the rest of the boys and to learn off the new coach and his style." Despite plying his trade at amateur level, Gulley said was reassuring to know he was on Schmid's radar, which could help his other goal as he chases a professional contract at the Wellington Phoenix, looking to add to the eight appearances he made during the 2015-16 A-League season. "I only played a handful of games for the Phoenix last time and I really think I could've done more, and it's an opportunity I'm keen to keep knocking on and working towards. Hopefully when a new coach comes in I can keep putting in good performances and get a look in." Gulley roomed with Cameron Howieson, who will be in the opposing XI when Team Wellington takes on Auckland City at QBE Stadium on Sunday, while in Spain. He said there was plenty of banter shared between the pair, especially once the two finalists were confirmed. Team Wellington have had the measure of Auckland City during the past two seasons and Gulley said his team were hoping to end the opposition's 1098-minute clean sheet record and make it a three-peat. "They're a very solid team to play against and I always enjoy playing Auckland City because it's always a real challenge and tough game, and you never get an easy result. But I'm looking to stop that 1000 minutes."